It is a lovely colour and tastes very nice, it would have been nicer had I used the butter and cream that was recommended but I stuck to a little oil and some milk as I am trying not to eat too much fat at the moment, still put in the sherry though lol. Mind you, I HAD to have doughnut today as it was someone's birthday and we always have 'buns' on birthdays - it wouldn't have been polite to refuse now would it? hee hee hee. 1. Ina heavy based saucepan, melt the butter then fry the onion gently until soft but not browned. 2. Add the sliced carrots and diced potato, stirring until well coated with butter. 5. put the soup into a blender of food processor and blend until smooth. 6. Return the soup to the pan, then stir in the cream and sherry and heat through without boiling. Serve sprinkled with parsley. You can prepare ahead and freeze it after step 5. Janice your carrot soup looks really delish. 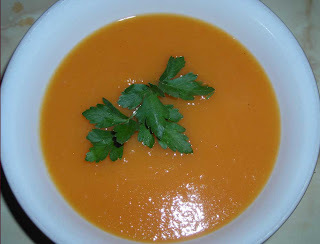 I made a carrot soup today too, seems like it's that time of year when one is craving winter warming food. Soup looks lovely. We have buns at work for going on holiday too! Hi Janice, what a lovely colour your carrot soup is and just what’s needed atm for these cold days.